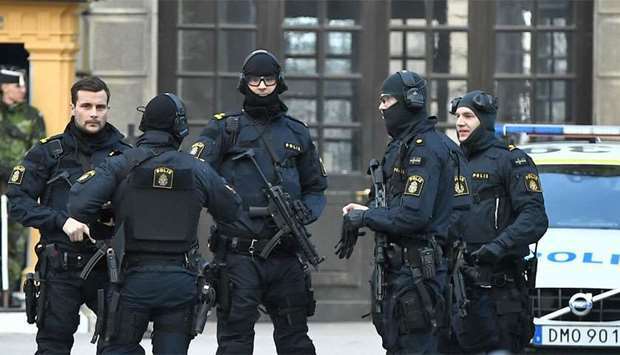 Three Central Asian men have been charged in Sweden with plotting to commit a terrorist crime as well as – along with three others – financing the Daesh militant group, prosecutors said on Thursday. The three are suspected of “obtaining and storing large amounts of chemicals and other equipment with the aim of killing and wounding other people,” the prosecution authority said in a statement. “If the terrorist crime had been carried out, it could have seriously hurt Sweden.” The trio were also charged, along with three other people, with financing terrorism. Prosecutors accuse them of sending money abroad to fund the so-called Islamic State’s operations.All six have denied the charges against them. The trial is expected to open on January 7th. “Three (of the suspects) acquired and stored large quantities of chemicals and other equipment in order to, among other things, kill and harm other people. If the terrorist crime had been carried out, it could have seriously hurt Sweden,” the Stockholm prosecutor’s office said in a statement. It said the six men were from Uzbekistan and Kyrgyzstan, both mainly Muslim, former Soviet republics. Five are in Swedish custody while the sixth man was freed pending trial; all have denied wrongdoing, the statement said. Thomas Olson, lawyer for one of the accused, told Swedish Radio his client had bought a large amount of chemicals from a bankrupt firm in order to try to sell it on, without success. “My client left very detailed explanations as to why he was in possession of these chemicals, explanations that have been confirmed by all outsiders,” Olson said. Prosecutors were not available for further comment. In June, Rakhmat Akilov, an Uzbek asylum seeker in Sweden, was sentenced to life in prison for killing five people in Stockholm with a hijacked truck in 2017. He stated during the trial that he wanted to punish Sweden for its part in the global fight against Daesh, which has claimed a string of deadly attacks across western Europe since 2015. The men, aged between 30 and 46, originally hail from Uzbekistan and Kyrgyzstan. Their residency status in Sweden could not immediately be verified. Five of the six have been in custody since a police raid in Strömsund, 600 kilometres (375 miles) north of Stockholm, in late April. The sixth man is not in custody. According to Dagens Nyheter, at least one of the suspects had been in contact with Rakhmat Akilov, a radicalized Uzbek asylum seeker who mowed down pedestrians in Stockholm with a stolen truck in April 2017, killing five people. Akilov was sentenced to life in prison in June 2018.